Escanaba, Michigan's (the UP to us Yoopers) favorite gourmet cook whips up a family recipe cookbook that will have you right back into your Grandmother's kitchen. 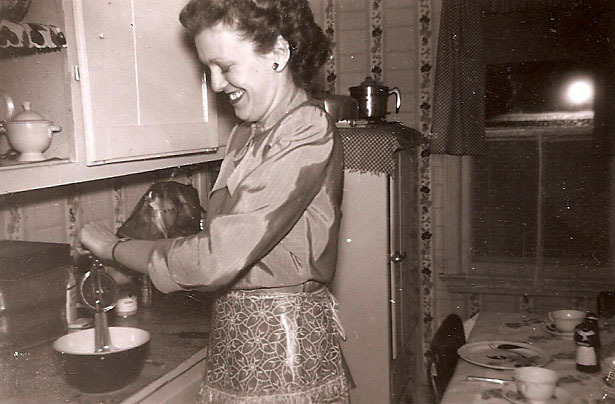 Rediscover Oleo, Cool Whip, cream of mushroom soup and Miracle Whip in Cooking with Gramma Cookie! Boil the potatoes in their jackets. Cool and rice them. Dice or coarsely grind the salt pork. Fry, and when nearly finished, add onion. Set aside to cool. Beat eggs and mix together and mix together with riced potatoes, salt and flour. Shape into cakes about 2 inches in diameter and 1 inch thick. With spoon or knife, insert a teaspoonful of pork mixture into middle of each cake and pinch back together. Boil in salted water about 10 minutes. They will rise to the top. They may also be cut in half and fried. Dumplings may be eaten hot or cold.